Choosing Raw: Good stuff here…yummy recipes and tons of information/FAQ on the raw diet. Radical Radiance: Courtney lives and works at Tree of Life in Patagonia, AZ…one of the many places I want to visit someday! Her blog always has great food photos, and she’s very open and honest about her journey with raw. Love it. Extreme Diets: Not a blog, but something fun. I’m so sad that I missed this re-airing last night, but there is another one on the 29th. Tivo it if you’re not up in the early hours of the morning 🙂 It looks like a fun show…with one of the participants being a raw food chef. I can’t pass that up! Entry filed under: Blogs, Inspiration. Raw Pesto Stuffed Mushrooms	Green Smoothie Challenge Testimonials & A GIVEAWAY! How funny, Sara! I just posted about Heather Eats Almond Butter too. I’m obsessed with both the PBu and the Marinutta she makes. You could make it with Almond Butter for Bella. It’s SOOOOOOOOO yummy! Extreme Diets – I’m so DVRing that! Thanks again and enjoy your holiday weekend. was trying to find an email but will write it here. 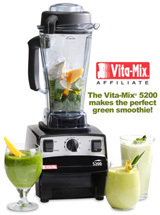 do you know what the vitamix container is made out of? i am just considering purchasing..but my curent blender has a glass container which i love. is the vitamix PC or some other plastic? thanks for your help! Thank you for your recommendation! I’m honored you enjoy my blog! Found your blog the other day and have gone through the whole thing to the beginning! Love the recipes and info…and today I made my first green smoothie and I liked it! I do not like eating greens, but drinking them – can do! Thanks for sharing everything! I will be visiting often!